On Monday the Academy of Actuaries will hold a press conference at the National Press Club to release a new paper on Social Security reform. The sneak preview, via the Associated Press's Jesse J. Holland, is that the actuaries favor raising the retirement age as part of a larger Social Security deal. Want to keep Social Security from going bankrupt? Make future recipients wait longer for their first benefit check because they probably will live longer anyway, an influential group of actuaries says. The next president and a new Congress will come under increasing pressure to act to fix the Social Security system. Democratic presidential candidate Barack Obama rejects any increase in the retirement age while his GOP rival John McCain opposes tax increases as a possible fix. The American Academy of Actuaries, which advises policymakers on risk and financial security issues, wants any potential solution the White House and lawmakers might consider to include raising the retirement age from the current range of 65-to-67-years-old. The group provided The Associated Press with an advance look Thursday of its recommendations. Current benefits are supplied by payroll taxes from today's workers, all of whom pay a 6.2 percent Social Security payroll tax on income up to $102,000. Their employers match it, for a total tax of 12.4 percent. The tax applies only to earned income, not to passive income such as dividends and interest. Benefits are projected to exceed the Social Security system's tax revenues in about nine years. The program's trustees have said the Social Security trust fund will be depleted by 2041 without changes. A major problem, the actuaries say, is that people are living longer. That means they are drawing more money from the program. When Social Security started in 1935, the average American's life expectancy was just under 60 years, according to the Social Security Administration. By comparison, people now eligible for Social Security can expect to live on average a little past 76, the agency says, "meaning workers have more time for retirement and more time to collect Social Security." For many years, 65 has been the retirement age to receive full benefits. But under changes in 1983, only people born before Jan. 2, 1938, can collect full benefits at 65. Those born after that date face a gradually rising retirement age for full benefits until it reaches 67. Current estimates show that by 2040, 65-year-old men and women could live at least 18 more years after becoming eligible for full Social Security benefits. "You just can't have people living longer and longer and longer, and have the program with a frozen normal retirement age of 67. It just doesn't make sense," said Bruce Schobel, the chairman of an academy task force on retirement security principles. "Eventually people will have a larger and larger proportion of their lives spent in retirement until you reach the point where we just can't afford it." The academy is not staking out a position on when people should retire and acknowledges that saving Social Security will take more than just raising the retirement age. "All that we're suggesting is that some increase in the retirement age should be part of any package," Schobel said. Obama already has rejected such advice. "We will not raise the retirement age," Obama said in June at a campaign event in North Carolina. Obama has, however, called for a Social Security payroll tax on incomes above $250,000 a year, compared with the current $102,000 threshold. "Barack Obama is opposed to raising the retirement age. He believes we should strengthen Social Security while protecting the middle-class families that rely on it," said Jason Furman, Obama's campaign economic policy director. "To that end, he would like to work with Congress on a plan to ensure that people making over $250,000 pay a little more to strengthen this vital program for generations to come." McCain originally said everything was on the table to fix Social Security. He recently has amended that position, saying he would not increase payroll taxes. "I want to look you in the eye: I will not raise taxes or support a tax increase," he told supporters Wednesday. Former Texas Sen. Phil Gramm, who served as a McCain adviser until he resigned earlier this month, told The Washington Times this month that a bipartisan deal to save Social Security might include raising the retirement age to 70 over 30 years. Sens. McCain and Obama are both in a bit of a fix here, although Obama worse than McCain. McCain can reject tax increases and still more or less fix Social Security, say through a combination of raising the retirement age and progressive benefit reductions for high earning retirees. (If you let the NRA rise to 70 by 2080 or so, you could do a benefit reduction that shielded the bottom half the earnings distribution from cuts.) The prospects for political success may be limited, but he can at least put together a plan that's plausible as policy. Obama's in a bit deeper: his plan to hit earners making over $250,000 would fix maybe 15 percent of the long-term deficit, and he's rejected raising the retirement age or cutting benefits. Where does the other 85 percent (much less the additional fixes needed to make the system sustainable beyond 75 years ) come from? If someone has an idea how they plan on making this work, please let me know. Update: Reader AK questioned whether raising the retirement age would be regressive, given the shorter life expectancies of low earners. The Excel file below shows that raising the normal retirement age wouldn't be regressive, since it would reduce everyone's benefits by the same amount. Raising the early eligibility age -- 62 -- would be regressive and cause larger percentage cuts for low earners. "I am opposed to raising taxes. Senator Obama wants to raise your taxes. He wants to raise your taxes and if any negotiation I might have when I go in my position will be that I am opposed to raising taxes, but we have to work together to save Social Security." McCain has been bashed from both sides for his recent statements on taxes and reform, and granted they've not always been as artful/programmed as some campaigns might want them to be. But the substantive position – I'm against raising taxes, but I'm not against talking to people who disagree with me – is a sensible one. Updates: The Wall Street Journal editorial page criticizes McCain for letting tax increase on the table; the Tax Policy Center is disappointed in McCain's seeming backtracking. The Auerbach/Lee paper covers much of the same ground as the working paper on resiliency of Social Security financing I put out through AEI a few weeks ago, though they take the extra step of evaluating how the reduction in uncertainty affects the welfare of different cohorts. The Delavande/Rohwedder presentation (unfortunately not available online) looked at an experimental online poll in which individuals were asked how they would react to a Social Security benefit reduction, by saving more, working longer, delaying claiming, etc. A very interesting exercise. All that said, his rhetoric can get a bit overheated at times. Here I'm thinking of a recent column, entitled "Vicious Ideologue Renews Attack on Social Security." If it were about, say, me I could understand the title. But in fact the vicious ideologue in question is Pete Peterson, the investment banker and former Commerce Secretary who has long supported the Concord Coalition and now funds a foundation dedicated to, among other things, raising awareness of future entitlement shortfalls. Cutting the "safety net": Dean in several places points out that Social Security and Medicare form "an essential safety net," implying that Peterson wants to reduce or (given his viciousness!) even eliminate it. What's not stated is that, in addition to their safety net functions, both Social Security and Medicare pay generous benefits to high earning households. It's easily possible to solve both their funding shortfalls without touching the safety net, but you wouldn't know this from Dean's article. "Peterson has long been an ardent foe of these programs." Again, I don't know Peterson's private thoughts. But I do know that the Concord Coalition, an organization Peterson has long been associated with, takes no position on whether entitlements should be fixed through increased taxes or reduced benefits. They merely argue that taxes and benefits must be equalized, and the sooner the better. (This opens them to attacks from folks like Peter Ferrara, who apparently agrees that they're vicious ideologues, just of a different stripe.) Now, the political culture is such that Americans will likely want to fix these systems with fewer tax increases and more benefit cuts than Dean would prefer (and probably more tax increases and fewer benefit cuts than I would prefer). But that's a different issue. There's more I could quibble with, but the larger point is ultimately we're going to have to come together to reach a compromise on these issues, and it's neither helpful nor, in my view, fair to make such strident attacks on other people character. This is a punch Dean should have pulled. Barack Obama's bid to place a new Social Security tax on very high incomes is either a bold or foolhardy plan, depending on who critiques it. But its potential impact is almost impossible to gauge because he is providing few details on basic questions such as what the tax rate might be, what types of income would be taxed and how the taxpayers' benefits would be affected. The Democratic presidential candidate says he would work with lawmakers from both parties to resolve such matters. Voters generally applaud bipartisan cooperation, but they apparently will go to the polls this fall with only a vague notion of what Obama has in mind. Obama made headlines June 13 when he called for a Social Security payroll tax on incomes above $250,000 a year. Currently, the tax is levied only on the first $102,000 of each worker's income. That covers the entire salary of most Americans. Obama would not apply the Social Security tax to annual incomes between $102,000 and $250,000, a move meant to avoid alienating several million upper-income voters. His proposed change would apply only to those earning more than $250,000 a year, or about 3 percent of all taxpayers. When he outlined his idea in the battleground state of Ohio, Obama said it is unfair for middle-class earners to pay the Social Security tax "on every dime they make," while millionaires and billionaires pay it on "only a very small percentage of their income." He also said the Social Security program needs revamping to bolster its long-term viability. With Obama offering few details, several news accounts suggested that his proposed tax on very high incomes would be applied just as the existing Social Security tax is levied on incomes up to $102,000. All workers pay a 6.2 percent Social Security payroll tax on such income. Their employers match it, for a total tax of 12.4 percent. The tax applies only to earned income, not to passive income such as dividends and interest. In recent weeks, Obama aides have quietly indicated that the proposed tax on incomes above $250,000 might be different in key aspects. The rate probably would be about 2 percent to 4 percent, not 6.2 percent, they said. It's also possible that it would apply to more types of income, including dividends and investments. As for benefits, the campaign has not said how the proposed tax on very high incomes would translate into new retirement income, if any, for those who pay it. The campaign "has not put forth a specific plan" for Social Security, Obama economic adviser Austan Goolsbee said in an interview. Perhaps because so many details are missing, Obama's Social Security proposal has generated relatively little debate on the campaign trail. But any change to the massive program could have far-reaching effects. Many Americans rely on Social Security for much or all of their retirement income. Some workers, meanwhile, do not realize how much is withheld from each paycheck for Social Security and, to a lesser degree, Medicare. Nearly three-fourths of all workers pay more in these payroll taxes than in federal income taxes, according to the Center on Budget and Policy Priorities. The center assumes that workers pay the full 12.4 percent in Social Security taxes, contending that employers would devote their half of the total to salaries if they did not have to make the 50-50 match. Given the dearth of details about Obama's plans, some Republicans have criticized it, using assumptions that Democrats reject. Lawrence B. Lindsey, a former economic adviser to President Bush, argues that high earners would pay the full 12.4 percent tax rate on income above $250,000 while receiving no added benefits. "A high-income entrepreneur would see his or her federal marginal tax rate rise to 53 percent from 37.7 percent," Lindsey wrote in a June 20 Wall Street Journal op-ed column. The marginal tax rate is what a person pays on each additional dollar earned. Lindsey wrote that Obama's plans would provide a powerful incentive for the highest-earning Americans to work less, invest less and contribute less to the economy. Former Oklahoma Sen. Don Nickles, a Republican, agreed. A person who owns two restaurants and makes $500,000 a year would have little incentive to open a third restaurant under Obama's tax plans, and might even close one, Nickles said in an interview. "He's not going to be hiring more people," Nickles said. Obama economic adviser Jason Furman, responding to Lindsey in a letter published by The Wall Street Journal, said Obama would "work with Congress on a bipartisan basis to design the details" of his Social Security plan, "including the tax rate, how it is phased in over time, the linkage between these tax payments and benefits, and other critical design elements of this plan." Furman wrote that Obama "has not proposed a 12.4-percentage point tax increase on earnings above $250,000." It seems that both presidential campaigns are slowly asymptoting toward the same general campaign position: pledge support for reform and a willingness to discuss different options with the opposing party in Congress, but don't offer a full reform plan that could be shot down during the campaign season. [I]n 2007, 88 percent of total Social Security tax income was spent immediately for current benefits and expenses, leaving a surplus at $80.3 billion. What happened to that surplus money? The federal government borrowed it and spent it on general budget expenditures. In return, Social Security got Federal IOUs, which promise to pay the money back, with interest. Over the next five years, from 2008 to 2012, the federal government will continue to raid (borrow) another $410 billion from the Social Security trust funds. Using personal accounts to "save the surplus" is a very attractive – perhaps the most attractive – argument for them, as they could stop a practice most Americans agree is dishonest and harmful to their future retirement security. Saving the surplus, far more than potentially higher rates of return or even a simple ownership argument, is probably the best way to sell personal accounts to typical Americans. I've used that argument myself, and in the past I think there was a lot of substance to it. Had we saved the Social Security surpluses generated since the 1980s, we would be sitting on a $2.5 trillion pool of assets with which to pay Social Security benefits rather than merely a stock of government bonds that will be repaid by raising taxes on ourselves in the future. That said, it's a basic rule of economics that we make decisions at the margin: what matters is what we can do going forward, not what we could have done in the past. And the sad truth is that we've put off Social Security reform for so long that there's really not much of a surplus left to save. Between 2008 and 2016 – the last year in which Social Security is projected to be in positive cash flow – cash surpluses will total around $462 billion in present value (assuming a 2.7% real interest rate). That's a good chunk of change, no doubt. But many people act as if saving the surplus would be sufficient to fix Social Security, or at least make a good sized "down payment on reform." Social Security's total long-term shortfall equals roughly $13.6 trillion in present value, meaning that even if we saved every penny of the surpluses going forward it would amount to only around 3 percent of the total shortfall. Not much of a down payment. Moreover, given the political economy of things, it's likely that even if that surplus were saved in personal accounts through 2017, the government would make up most of it through increased borrowing. So the net take would likely be less than 3 percent. Now, 3 percent is better than nothing, and a lot further than Social Security reform has gone to date. But even accounts to save that modest amount would demand vast amounts of political capital, almost surely more than the reform movement has at this point. While accounts have a role to play – an important one, in my view – to be viable that role, and how the accounts would be financed, should be fleshed out in more detail than in a simple "save the surplus" approach. Sen. John McCain made clear this weekend that when it comes to fixing Social Security, "everything is on the table," including a possible payroll tax increase. "There is nothing I would take off the table. There was nothing I would demand," McCain told ABC News' George Stephanopoulos in an exclusive interview on "This Week." "I think that's the way that Ronald Reagan and Tip O'Neill did it -- and that's what we have to do again." When asked if that includes a possible hike in the payroll tax, McCain reiterated that nothing -- including such a tax hike -- is "off the table." "I don't want tax increases. Of course, I'd like to have young Americans have some of their money put into an account with their name on it," McCain said. This will provoke protest from some, who think that tax increases should never even be considered, and others, who will simply view it as a flip-flop. For myself, I don't see an inconsistency between Sen. McCain saying he opposes tax increases for Social Security but is willing to talk to people who favor them. (Similarly, my main beef with Sen. Obama's plan to levy taxes on earnings above $250,000 isn't the policy – though I don't particularly like it – it's that he's portrayed it as meaning he could rule out benefit reductions or increases in the retirement age, which isn't the case.) It's important to distinguish what we favor and oppose from things that are "must haves" or "can't haves." In the 2005 reform debate, the Democratic leadership considered personal accounts funded from payroll taxes a "can't have," so much so that they wouldn't discuss anything unless they were taken off the table. Many Republicans have a similar view toward raising taxes to fix Social Security. While I favor personal accounts and oppose tax increases, refusing to talk unless options you oppose are taken off the table is a recipe for inaction, and the longer we put off taking action the more difficult the problem will be to solve. After a two-year hiatus, Social Security has made its way back onto the political stage. Both presidential candidates, recognizing that the program is insolvent over the long-run, are claiming that they will confront the system's $4 trillion long-term shortfall. Senator Barack Obama has made a specific proposal to finance part of the shortfall through a tax on people making over $250,000 a year, while Senator McCain has pledged that he'll "fight to save the future of Social Security" and "won't leave office without doing everything [he] can to fix [it]." Although neither candidate has made this a central campaign issue, they should be lauded for their willingness to address it. Yet if history is any guide – especially recent history – they will face considerable obstacles in enacting real reform. Goldwein's article has an insightful view the Bush administration's handling of Social Security reform, and lessons for whoever becomes President in 2009. Click here to read the whole story. SSA has released a new online version of the Social Security Statement, which allows users to electronically access an estimate of their future Social Security benefits, as well as to alter assumptions regarding future wages and the age at which they will retire. This is a good step forward in helping Americans plan for retirement. However, the new online calculator needs to be clearer about the benefit estimates it provides. The calculator does not specify whether dollar figures are in "current" or nominal dollars, meaning the actual dollar amount you would see on your check when you retire, or in today's dollars, meaning dollars adjusted for inflation to give a better feeling for the purchasing power of your future benefit. In fact, as discussed in this op-ed, the Social Security Statement and the new online calculator don't do either. The benefit estimate is expressed "wage indexed" dollars. Technically, this means that the future dollar amount is discounted by the rate of compound wage growth between the time the estimate is made and the time of retirement. (If you want to do the math, the wage indexed benefit , where Bc equals the current or nominal benefit amount, g equals the average rate of nominal wage growth, and n equals the number of years until retirement. Here's an example: let's say that the nominal benefit amount you would receive – that is, the actual dollar figure on your monthly Social Security check – would be $2500 and you have 20 years until you plan to retire. Typically, you would either think about the benefit in nominal terms or, better, convert it today's dollars to better represent what the benefit can actually buy. Assuming 2.8 percent annual inflation, as the Trustees do, the benefit in today's dollars would equal $2500/(1+0.028)20, or $1,439. However, expressed in wage-indexed dollars the figure will be significantly lower. Assuming that wages rise 1.1 percent faster than inflation (as the Trustees projection), the wage-indexed figure would equal $2500/(1+0.039)20, or $1,163, a difference of $276 per month. The new calculator is at least superior to the Statement, which says that benefits are "in today's dollars" – meaning inflation-adjusted dollars, when they're not. But first, it's not clear how helpful the new calculator will be when it does not even state what terms the benefit figures are in, and second, even if that were made explicit, it's not clear how helpful a wage-indexed dollar amount is. Why? The purpose of a benefit estimator is so that people can determine whether they're saving enough on their own to provide for a comfortable retirement. Remember, Social Security wasn't intended to cover all retirement needs. Most people who have a defined benefit pension receive an estimate of future benefits in nominal terms. For people estimating the benefit payable from a DC pension, such as a 401(k) or IRA, they'll either project it in nominal or in real terms. (For instance, this retirement income calculator from AARP deals mostly in today's dollars, as does this 401(k) calculator from Quicken.) To be useful in making comparisons, a wage-indexed Social Security benefit figure must be converted to either nominal or inflation-adjusted dollars, which is well beyond the skills of the typical person even if they knew the conversion needed to be made. Again, at the very least, users should be notified of what kind of dollars their benefits are estimated in. Preferably, they would be given a choice between nominal and inflation-adjusted dollars, and provided with information on what each figure means. Choosing your retirement age isn't about maximizing your lifetime benefits – for the typical person, these are the same regardless of when you claim – but ensuring you'll have enough income later in life. Social Security benefits last as long as you live, and so are valuable insurance against outliving your assets. While the average 65 year old lives to age 83, about 25 percent will survive to at least age 90 and 10 percent will live past age 95. Delaying claiming doesn't just increase your benefit, it also raises benefits for your survivors. A simple "break-even age" approach doesn't factor in survivors benefits. The earnings test isn't a tax; while you may lose some benefits before the full retirement age, you'll receive an increase afterwards to make up for them. Kudos to the SSA staff who put this together. You can download the pamphlet here. Would raising the retirement age be regressive? It's sometimes commented that increasing the Social Security retirement age would be regressive. This makes sense at first glance, since lower earners tend to have shorter life spans that higher earners. However, an increase in the normal retirement age is equivalent to an across the board benefit cut – for each year the retirement age rises, benefits are reduced by around 6.7 percent. So there's no particular reason to think raising the retirement age would be any more regressive than any other benefit cut. The figure below compares replacement rates by earnings percentile for current law and an increased retirement age. While this isn't decisive, visually there doesn't appear to be any strong deviation by earnings level. (Bear in mind that while the sample population was over 47,000, when examined by individual earnings percentile sample sizes were smaller.) There are other ways to calculate things, but at this point this seems to confirm my prior belief that progressivity wouldn't change very much. Why Do We Need to Work Longer? • Americans need to work longer due to a contracting retirement income system, longer lifespans, and rising health care costs. • Working longer does not mean working forever — the goal should be to move the average retirement age from 63 to 66. • Working longer improves retirement security by: 1) boosting monthly Social Security benefits; 2) allowing workers to build up larger 401(k) balances; and 3) reducing the period over which households must rely on their retirement assets. Will We Be Able to Work Longer? • Most people will be healthy enough to work until at least 66. Will We Want to Work Longer? • Reasons for Hope: For men, the century-long decline in their labor force participation has halted and even begun to reverse. For women, labor force patterns have been converging toward those of men. • Reasons for Caution: The ability to claim Social Security benefits at age 62 is a powerful inducement to retire. Also greater job turnover makes employment more difficult for workers in their fifties. Will Employers Want to Employ Us? • Reasons for Hope: Employers value older workers' productivity and reliability. And some industries could experience labor shortages as the population ages. • Reasons for Caution: Employers are concerned about older workers' wage and health care costs and question their ability and desire to keep their skills current. Also, many employers can tap a global labor market to replace older workers. How Can We Encourage Longer Work Lives? • Workers: Make a plan to keep working and stick to it. • Employers: Redesign production and personnel systems to fit older workers. • Federal government: Raise Social Security's Earliest Eligibility Age. • State government: Develop job skills and job matching programs. Also, click here for a list of myths regarding retirement that Munnell and Sass discuss, and click here to order a copy. On Monday, the AARP held an event on "Campaign 2008 and the Federal Deficit" featuring Doug Holtz-Eakin speaking on behalf of the McCain campaign, Jeff Liebman speaking for the Obama campaign, with commentary from Diane Lim Rogers of the Concord Coalition (Economist Mom blog) and John Rother from AARP. The event was emceed by David Wessell of the Wall Street Journal. Here's a link to the main page, and here's a direct link to the video player. Most seniors view the Social Security earnings test as a "tax" that reduces their Social Security benefits by fifty cents for each dollar they earn above a modest limit. In fact, the earnings test is not a tax at all: at a person's full retirement age, Social Security increases benefits to account for any lost to the earnings test in earlier years. Over the typical retiree's lifetime, total benefits are almost exactly the same. Most retirees are unaware of this because the Social Security Administration (SSA) and financial advisers fail to inform them of how the earnings test works. Retirees need better information--and policymakers should consider whether the earnings test makes sense at all. The basic story is that the earnings test has all the bad parts of a tax – distortion choices, limiting earnings, pushing people out of the workforce – without the good part, raising any revenue. People think of the earnings test as a tax because they're not told that at the full retirement age SSA adjusts their benefits to account for any months of benefits lost to the earnings test. At the least, we need to better inform the public; we should also think about whether the earnings test really makes sense going forward, given how hard it is to educate people about it. UPDATE: For those interested in how the repeal of the earnings test for individuals over the full retirement age has played out, I should have also cited this paper by Joyce Manchester (CBO) and Jae Song (SSA). Here's a new clip from CNBC featuring Rep. Paul Ryan talking about his proposals for Social Security and Medicare reform, and David Walker of the Peter G. Peterson Foundation talking broader entitlement issues. More info on Ryan's plan is available at www.americanroadmap.org while more information on the Peterson Foundation is available here. The LA Times Peter Wallsten writes on Sen. McCain's views on Social Security reform. McCain, the presumed Republican presidential nominee, spoke several times last week about changing how the popular retirement program is funded, at one point calling it a "disgrace" that younger workers are forced to pay for a plan that, in his view, is unlikely to benefit them when they retire. Democrats are gearing up to turn McCain's stand on Social Security, and his willingness to consider a privatization plan, into a key campaign issue. They say changing the program in that way would undermine retirees' benefits, and they hope to use the issue to harm the Arizona senator's support among a set of voters who tilt toward him -- seniors. The story is more politics than policy, but worth reading for that angle. The study, set to be released tomorrow, finds that Americans will have to drastically reduce their standard of living before retirement to live comfortably, or even avoid destitution, later in life. Middle-income Americans entering retirement now will have to reduce their standard of living by an average of 24 percent to minimize their chances of outliving their financial assets, the study found. Workers seven years from retirement will have to cut their spending by even more -- 37 percent. "Most people, if they look at their life expectancy and they think they will live to 90, they are nuts to retire at 60. They're going to be living in poverty at 80," said Peter Morici, an economist at the University of Maryland. "I think it's a wake-up call to baby boomers to get serious about getting their houses in order." Now, with rising life expectancies and fewer defined benefit pensions, it is more important to think about making your money last. A 65 year old may have an average life expectancy of around 83, but there's a non-trivial chance of living to 90, 95 or beyond. You need to play for those years if you don't want to end up running short. So what's the problem with the article? The study, undertaken by Ernest & Young, was commissioned by Americans for a Secure Retirement, a group that essentially lobbies on behalf of the insurance industry to get government subsidies for annuities. Now, I think more people should annuitize and subsidies might be a good idea, but there's very little hint in the article that the study might be self-serving. There are plenty of good academic studies, including some that conclude that most American retirees are doing just fine. (For example, this paper which concludes that "Fewer than 20 percent of households have less wealth than their optimal targets, and the wealth deficit of those who are undersaving is generally small.") I'm not sure we need to rely on studies funded by groups with a clear financial incentive. Second, while it's nice to have a quote from an outside expert, Peter Morici is a trade economist – and I'm sure a fine one – not an expert in retirement issues. There are a lot of readily available experts on broad retirement security – say, Alicia Munnell at Boston College or Olivia Mitchell at the Pension Research Council – and a story would benefit from talking to them. So again, the story's conclusions are good, but I'm not so keen on how they got there. (1) First, it's time to start raising the retirement age. Social Security started in 1935, and at that time slightly more than half of workers lived to reach the retirement age of 65. These days, though, lifespans are much longer. Our government needs to encourage people to work longer or, at least, not tap their benefits at age 62. The best way to increase the retirement age would be to increase it over time (say two months per year until it reaches, say 68) and then index it for longevity after that. (2) Lawmakers should ensure that Social Security and other entitlements only go to those who need help. Bill Gates, for example, recently stepped down from Microsoft. In 10 years, this multibillionaire can start collecting Social Security and Medicare. That's absurd. Reducing payments to wealthy seniors would leave more available for lower-income retirees. (3) Finally, our government needs to shore up Social Security with personal retirement accounts. The concept is simple, and would work similarly to an individual retirement account (IRA) or 401(k). All workers would be able to invest a small percentage of their Social Security taxes in an account that they would own. The money would go into a few simple, low-cost investments that would grow over time, just as other retirement plans do. These accounts would not replace employer-sponsored retirement plans but increase the ability of Social Security to pay benefits to them. No problem with number 1. Number 2 is more problematic; while Bill Gates doesn't care about his Social Security benefits, to make a real dent in the shortfall you have to cut benefits pretty significantly for the upper middle class on up. (If you didn't want to raise taxes at all, you'd effectively have to price index benefits for everyone, rich and poor, which implies an approximately 1 percent reduction in scheduled benefits per year.) Number 3 is fine by me, but – as with numbers 1 and 2 – he should explain why he wants personal accounts. Looking around the world, some government pension plans pay high benefits (with high contribution rates). These plans tend not to be very progressive. Likewise, plans paying lower average benefits tend to be more progressive. I've put together a chart below based on data from the OECD, where the average replacement rate is on the vertical axis and the level of progressivity is on the horizontal axis. (Progressivity runs from 0, which implies a totally earnings related plan, to 100, which implies a flat dollar benefit for everyone, regardless of earnings.) You can see visually, and a quick regression confirms, that the two are highly correlated: about half the difference in the size of a program can explained by looking at the progressivity of the program. Countries with earnings-related public pension programs have considerably higher contribution rates than those with flat-rate benefits. Disney (2004) reports that the effective contribution rates in the 10 OECD countries dominated by flat-rate systems varied between 14.7 percent in Australia and 23.7 percent in the United Kingdom in 1995. The range in the 12 OECD countries with more earnings-related benefits was between 22.4 percent in Germany and 57.7 percent in Greece. The average effective contribution rate was 19 percent in countries with flat-rate benefits, and 35 percent in countries with earnings-related benefits. The relationship between the level to which benefits depend on past earnings and Social Security contribution rate has received little attention in the political economy literature, despite its robustness. In this paper, we suggest an explanation based on a standard trade-off between economic efficiency and redistribution. The efficiency cost of redistributing income is lower when benefits are earnings-related, encouraging voters who benefit from Social Security to support higher contribution rates. Low income voters weigh this effect against the reduced redistributiveness of more earnings-related systems. Our numerical analysis of several European countries suggests that the median voter model is able to explain the stylized fact that intragenerationally more redistributive social security systems are smaller. The social security contribution rates predicted by the median voter model also have a strong correlation with the effective rates calculated by Disney (2004). This means that our median voter model is able at least in part to explain the levels of contribution rates and their cross-country differences. Even though our analysis focuses on steady-state political equilibria, our main result that benefit formula significantly affects political equilibrium contribution rates can be expected to hold also outside of steady-states. This suggests that the political response to population aging may crucially depend on to what extent benefits are linked to past contributions. This last sentence is important, as Social Security proposals on both sides tend to make the system more progressive. Sen. Obama would increase taxes on high earners while implementing a tax credit to effectively lower payroll taxes for low earners. On the GOP side, most plans focus on reducing benefits for high earners, such as through "progressive price indexing." Social Security's progressivity hasn't changed a lot over the system's history, and it will be interesting to see how these proposals might alter political support for the program. …Social Security is not an entitlement like welfare that can be cut off if we earn too much. All of us, rich and not so rich, have paid into Social Security. It is a guaranteed defined benefit pension program, which also provides insurance benefits for survivors and minor children of a worker who has died. "Means-testing Social Security would change its nature and destroy the system. Universal coverage, regardless of need, is one of Social Security's strong points. Millionaires do receive benefits, but they also pay into the system. Their benefits represent a smaller return on what they pay than do the benefits of lower-paid workers." Just as a company's pension system does not take into account a beneficiary's needs, Skidmore writes, "Building in 'need' as a criterion to qualify for benefits would require the majority of Americans to contribute for a lifetime to a program from which they could draw no benefits." This question becomes important when we think about Sen. Obama's proposals, which would shift the tax burden significantly to the rich by imposing new taxes above $250,000 and providing a refundable income tax credit to low/middle earners to compensate them for payroll taxes. Likewise, President Bush's plan for "progressive indexing" for benefits would have imposed significant reductions on high earners, modest reductions on middle earners, and no reductions at all on low earners. 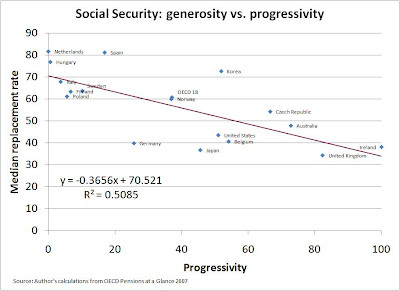 While some take it for granted that Social Security reform should be highly progressive, and argue only over whether it should be accomplished on the tax or the benefit end, policymakers should bear in mind how that may alter the not-particularly-progressive tax/benefit structure Social Security has had since its founding. This paper presents findings from the 2008 Recent Retirees Survey, sponsored by the Employee Benefit Research Institute (EBRI) to better understand the tools and practices that might encourage workers to postpone their retirement and remain longer with their company. It finds that retirees typically retired from employers for one of four reasons: retirement becomes affordable, lack of job satisfaction, a desire for more personal or family time, and/or their own health status. One of the major findings from the survey is that employers have a narrow window of up to two years in which they may be able to intervene to change retiring workers' decisions by offering them incentives to remain with the company. Although no single incentive is likely to motivate a majority of retirees to stay longer with their employer, it appears that employers may be able to assemble a toolkit of alternatives that would be effective in retaining substantial numbers of workers at retirement age. The survey tested a total of 19 possible incentives that might encourage retiring workers to postpone retirement. The most likely incentives to be successful are: (1) feeling truly needed for an assignment; (2) allowing the worker to receive a full pension while working part time; (3) a pay increase; (4) continuing to receive company subsidized health insurance benefits at the same level as full-time workers while working part time; (5) allowing the worker to receive a partial pension while working part time so that total income remains the same; (6) being able to work seasonally or on a contract basis. The full paper is available through the Social Science Research Network. Trib: What specifically can you do? McCain: I think you have to do two things. One, do a better job than has been done in the past of convincing people that it's broken. I think you can do that with one chart that shows how much money is going out and how much is coming in, and when there's more going out than coming in and when there's no money left. And so you have to get that sense of urgency to the American people. And the second thing, you've got to say, 'Look, everything is on the table, let's sit down at the table.' That's what Ronald Reagan and Tip O'Neill did in 1983. They sat down, they put everything on the table. A lot of people didn't like the solution they came up with, but when the liberal Democrat from Massachusetts and the conservative president from California said this is the fix for Social Security, it went through. So you've got to put everything on the table. And for me to stand here and say we've got to have this, this and this, all that does is set things up for a confrontation. What I'm saying is I'll sit down at a table with Harry Reid, Nancy Pelosi, John Boehner and Mitch McConnell, and we'll sit down and we'll work it out, and we'll walk out and I'll give them all the credit. I'll give them all the credit because we've got to fix it. But first -- so that's my plan for fixing it. Trib: Well, if private retirement accounts are part of the mix, we saw the opposition to that already in 2005. So could that still be part of the mix? McCain: Everything has got to be on the table. And let me just say again, I believe that young people ought to be able to invest money in accounts with their names on it. And that means young people voluntarily. Now it got all hung up the last time with all kinds of allegations and that became the focus of the debate, rather than the crisis that Social Security is in. So I'm saying everything is on the table. I favor the ability of young Americans to put money into, on a voluntary basis, into an account with their name on it. That's what I favor. Other people favor different things. You've got to sit down at the table and you've got to hammer it out. Trib: Do you favor raising the cap? McCain: No, and I think by doing so, as Sen. Obama wants to do, you are obviously putting a very, very big increased tax on ... middle income Americans who filing jointly and in other ways will be paying a very big increase. But s note to McCain campaign: The current payroll tax is levied on individual earnings, so for an increase in the tax cap to affect a couple one or more of them must have individual earnings above the current ceiling of $102,000. It's commonly been stated that a middle class couple with combined earnings above $102,000 would be affected by an increase in the cap (the stereotypical teacher and firefighter, etc…), but this isn't the case. Now, apparently the Obama campaign has considered applying the payroll tax to household earnings instead of individual earnings. This actually isn't a bad idea as policy, but would complicate the question of who would be impacted by Sen. Obama's proposals. This morning's news is that in an event Monday Sen. John McCain used the words "Social Security" and "disgrace" in the same paragraph, thereby prompting headlines such as "McCain Says Social Security Is 'A Disgrace'" on the probably non-entirely-unbiased AFL-CIO blog. First, McCain said that, unless Social Security is fixed, younger Americans won't receive the benefits that present-day retirees have. In one sense, this is wrong – real, inflation adjusted retirement benefits for future cohorts will be just at least as high as for today. However, in another sense – and, to be blunt, the sense that most of the left interprets "benefit cuts" – McCain was correct: future retirees won't receive the full promised benefits that current retirees are, and thus won't receive the same replacement rates (benefits relative to pre-retirement earnings) that current retirees do. Third, this is really pretty silly stuff. Yesterday's Washington Post provided some additional details on Sen. Obama's proposals for Social Security. The campaign is looking at applying a tax of 2 to 4 percent total between employers and employees on earnings over $250,000. The campaign does not say whether additional benefits will be paid based on those taxes. My educated guess is that it's highly improbable that additional benefits would be paid. If benefits were paid based on the current benefit formula the provision would lose money, simply because a 2-4 percent tax isn't sufficient to finance benefits even under the 15 percent replacement factor in the Social Security benefit formula. Moreover, even if additional earned benefits were scaled down, which is possible, the net savings to Social Security would be extremely small. So for these purposes, I'm assuming a 2-4 percent surtax on wages over $250,000, very similar to the surtax used in the Diamond-Orszag proposal from a few years back. I've simulated a 4 percent surtax using the GEMINI microsimulation model developed by the Policy Simulation Group, assuming the tax increase is imposed as of 2015. Results are relative to the baseline estimates of the 2007 Trustees Report, which projected that Social Security would begin running cash deficits in 2017, face trust fund insolvency in 2041, and run a 75-year shortfall equal to 1.95 percent of taxable wages. Compared to the 2007 baseline, a 4 percent surtax above $250,000 would delay cash deficits from 2017 to 2018, trust fund insolvency from 2041 to 2045, and reduce the 75-year deficit from 1.95 percent to 1.68 percent of payroll. In the 2008 Social Security Trustees Report, the projected 75-year shortfall was reduced from 1.95 percent to 1.70 percent of payroll, principally based on changes in methodology for modeling the effects of immigration on system financing. Therefore, it can be expected that the 75-year shortfall under Sen. Obama's proposal would be lower than calculated above – somewhere in the range of 1.5 percent of payroll. That said, even based on the reduced 2008 deficit, the Obama proposal would come nowhere close to restoring long-run solvency. Sen. Obama advertized his original plan as a means for avoiding benefit reductions or increases in the Social Security retirement age, but these calculations make clear that these steps would be needed in addition to the tax increase on individuals earning over $250,000. While these numbers are based only on educated speculation regarding the final form of Sen. Obama's proposal, it is unlikely the net results would differ significantly. The Washington Post's Perry Bacon Jr. reports this morning on how Senators McCain and Obama are looking at Social Security reform. Not too much new information on the McCain approach, but new details added on Sen. Obama's plan. Will return to the subject later with more info. McCain steering clear of entitlements? Asked on a conference call with reporters just how John McCain would balance the budget by 2013, his top economic adviser offered the usual recipe. "Broad-based efforts at controlling discretionary spending, keeping growth rapid and reviewing programs for their effectiveness." Of course, with McCain's proposed tax cuts, that still may not get the country to a balanced budget. Which is where Holtz-Eakin's next statements come in. McCain, noted his adviser, "has a long history of being someone who can reach across the aisle" to address policy issues. He'll "solve big problems and provide leadership," Holtz-Eakin said, staying vague. Don't get what he's talking about? It's the issue that dare not speak its name during a campaign -- what to do about those entitlements that take up a much larger slice of the federal budget than any earmarks McCain wants to cut. What Holtz-Eakin was suggesting, of course, is that McCain would work with Democratic leaders in Congress to address the increasingly heavy fiscal load that will come when baby boomers retire and start drawing Social Security, Medicare and Medicaid. The political challenge is saying during the course of a campaign just how you'd balance the budget by addressing this looming challenge. McCain dares not propose increasing taxes on Social Security for fear of offending his tax-averse GOP base. But he also, wisely, fears the wrath of seniors in such key elderly-heavy states such as Florida and Pennsylvania that would come were he to propose cutting benefits. So instead it's mostly a wink and a nod -- the suggestion, if not outright proposal, that McCain will work and compromise with Democrats on the Hill to offer the needed harsh medicine that can't be unsealed until after Election Day. Reform Social Security: John McCain will fight to save the future of Social Security, and he believes that we may meet our obligations to the retirees of today and the future without raising taxes. John McCain supports supplementing the current Social Security system with personal accounts – but not as a substitute for addressing benefit promises that cannot be kept. John McCain will reach across the aisle to address these challenges, but if the Democrats do not act, he will. No problem is in more need of honesty than the looming financial challenges of entitlement programs. Americans have the right to know the truth and John McCain will not leave office without fixing the problems that threatens our future prosperity and power. As boomers quit working and ease into their golden years, they could break the backs of the younger workers who will have to support them. We're running out of time to fix senior-citizen entitlement programs before a crisis strikes. Boomers' retirement will be bad for the economy. The politicians know what needs to be done; they just lack the will to do it. Saving the budget will require either major reductions in the old-age entitlement programs or major tax increases -- or both. If you want to know why they're myths – to be honest, I find some of it not totally ready for prime-time – you'll have to read the whole thing. I have a new working paper that examines auto-correction policies for Social Security taxes and benefits that would help adjust for uncertainty regard future demographics. (I talk a bit about adjusting for economic uncertainty, but will do some more detailed work on that in the future.) Here's the basic story, in pictures. Figure 2 shows the probability distribution of Social Security's net cash flow (income minus outgo), programmed to match the stochastic simulations contained in the Social Security Trustees Report. The median outcome matches the Trustees intermediate projections, but there's obviously a ton of variability. There's about a 1 percent chance we'd be almost in positive cash flow in 2080, but an equal 1 percent chance of cash deficits of 12 percent of payroll. What can policy do about this? One policy option is to index initial benefits to price growth rather than wage growth. This will definitely improve expected outcomes for solvency – based on the intermediate projections, this chance alone would fix financing in perpetuity. However, price indexing also increases uncertainty regarding system financing, because benefits no longer adjust to changes in wages (higher wage growth equals higher benefits, lower wage growth equals lower benefits). Figure 4 below illustrates: the median outcome is a lot better than current law, but the level of uncertainty is actually higher. So here's an alternate idea: index changes in taxes and benefits to changes in the ratio of workers to beneficiaries. Long-run, demographics are the biggest sources of variation in system financing (because most of the economic uncertainty gets handled through wage indexing of benefits). The worker-beneficiary ratio accounts for both changes in fertility (workers) and mortality (beneficiaries). If we index to that, we'll account for much of the uncertainty in the long run. Figure 6 illustrates indexing of benefits to the worker-beneficiary ratio, although the paper also contains a similar chart showing tax indexing. I set things up so that the average affect of the change on solvency would equal that of price indexing – that is, sustainable solvency based on cash flows. However, the level of uncertainty is far smaller. This approach has several advantages. First, it helps deal with the folks who claim the Trustees are pessimistic and there's no real problem lurking in the future. If so, there's no danger in implementing auto-correction policies, since they only make changes as needed. This might help get reform enacted sooner, which is important. Second, auto-correction policies keep financing on a stable basis, which helps smooth burdens more reliably between generations. Without auto-correction, policymakers are likely to wait until the last minute to make changes, which inevitably pushes larger burdens off onto later generations. Third, auto-correction policies give future generations the chance to change Social Security as they wish, from a baseline of solvency rather than insolvency. There are some other issues to address, such as indexing for economic uncertainty, how to deal with uncertainty regarding how future outcomes are modeled – e.g., the large change in Social Security solvency that occurred in the 2008 Trustees Report was principally due to changes in how immigration was modeled, not to assumptions regarding immigration levels. But as a general class of reforms, I think auto-correction policies have an important role to play. Plus, Obama policy guru Jason Furman also likes them, which means we may see them sometime in the future.